This demo from Fujitsu presents a convincing case for their innovative touchscreen projector technology. Take a look at the video, and see how real-world materials like books and magazines can be copied into a virtual space and then manipulated. "We think paper and many other objects could be manipulated by touching them, as with a touchscreen. This system doesn't use any special hardware; it consists of just a device like an ordinary webcam, plus a commercial projector. Its capabilities are achieved by image processing technology." This technology measures the shape of real-world objects, and automatically adjusts the coordinate systems for the camera, projector, and real world. In this way, it can coordinate the display with touching, not only for flat surfaces like tables and paper, but also for the curved surfaces of objects such as books. This system also includes technology for controlling color and brightness, in line with the ambient light, and correcting for individual differences in hand color. In this way, it can identify fingertips consistently, with little influence from the environment or individual differences. Also, in situations that don't use touch, the system can be operated by gesturing. In this demo, when you move your fist, you can manipulate the viewpoint for 3D CAD data. So, there could be applications for this touch system by combining it with current gesture systems. I was thinking that this device could be used in several different contexts. For one thing, it would be ideal for students who need to work with their own computer word processing or other report-preparation systems to quickly bring in materials that had not been digitized. For example, suppose you had found an illustration in a book or magazine that you wanted to include in a report. Another use would be at a government center where you needed to present documents in order to obtain a drivers license or pay a fine. You could put your information on the desk in front of the clerk, who would quickly manipulate your paper items and bring them into an onscreen, computerized system. I could see how this would be useful in banks or other such institutions as well. I can't think of a specific science fictional example for this interface. The earliest use of a projected virtual interface that I can think of is the virtual keyboard presented in Frederik Pohl's 1965 novel The Age of the Pussyfoot. 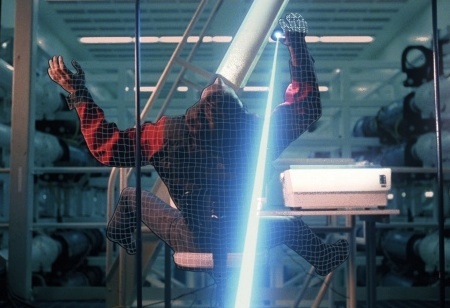 I'll probably be called for overreaching on this one, but the first thing I thought of when viewing how this technology works was the scenes in the memorable 1982 movie Tron when Jeff Bridges was digitally scanned and then captured, forced to enter the virtual world of the computer.